For use on 1967 - 1968 Camaro dashboard. 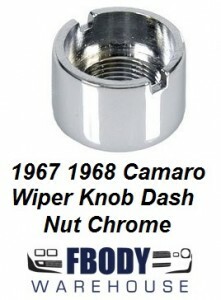 This is a new replacement chrome bezel nut for the windsheild wiper knob. Replaces pitted or worn GM units in minutes and enhances the look of your interior dash area! Use the drop down menu to select ship to location.